The Bumperchute tailgate command post system was originally designed as a mobile LAPD police command post. Adopting the traditional black and white for police first responders makes the product perfectly suited for establishing a police command post. January 29, 2013	(Newswire.com) - The Bumperchute tailgate command post system was engineered from careful evaluation and feedback provided by first responders. 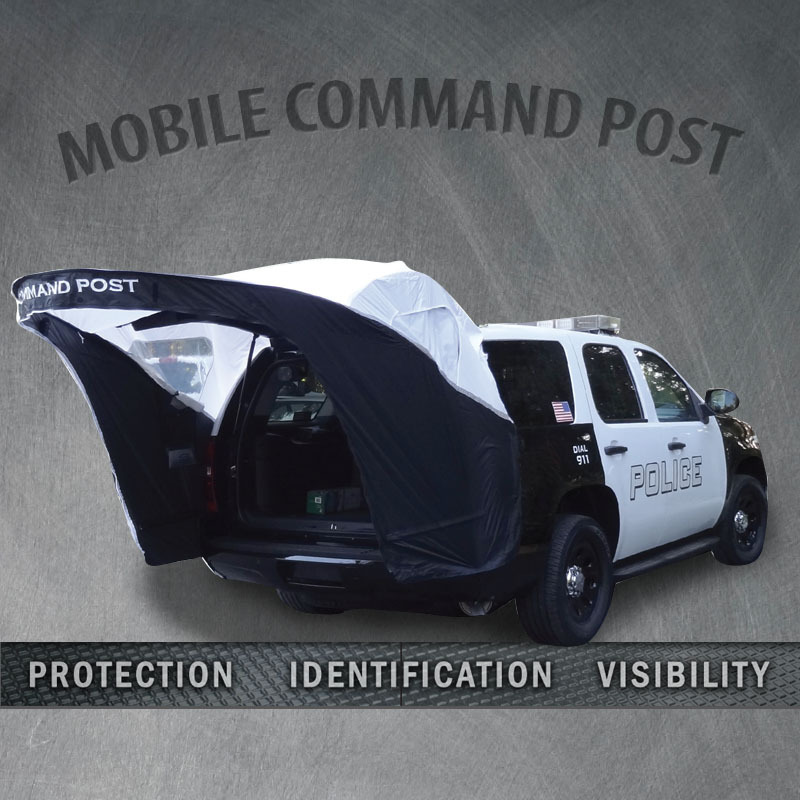 This modified product by Bumperchute is designed specifically as a police vehicle command post. The black and white version is currently in use as a mobile LAPD police command post solution and with police responders in New York and Chicago as well. The functionality of this product may have been best demonstrated in it's feature debut on the hit series CSI "Still Life" episode. The tv show capitalized on the products' high visibility and easy identification. There was no mistaking that this was a police crime scene. In actual use, real police officers capitalize on those features plus the added protection the product provides. The Bumperchute, mounted to the rear of a police SUV, provides an additional 3 feet of sheltered working space turning the work station into a mobile command post. Many police SUV's are fitted with rear cabinet slide trays. The Bumperchute provides complete weather protection for the rear of the vehicle. Police are finding more uses than anticipated for this product. The Bumperchute was designed to help police first responders to quickly set up and manage an incident zone. An incident zone being anything from a car accident to a chemical spill or stand-off. However, the LAPD are finding use for the Bumperchute at local fairs, shows and other non-incident related events. Setting up the police command post is quick and easy, any IC commander can do it alone in less than 2 minutes. This tailgate canopy provides overhead and side panel protection from the elements. Bumperchute first responder products are inspired by the suggestions and recommendations of Incident Commanders and emergency responders across the country. Every Bumperchute emergency responder product is carefully designed to exacting standards in order to support the vital services first responders provide. Bumperchute Co., makers of the versatile tailgate command post join IMS Alliance in debuting the Tripod Command Post Flag and Light at the 2013 Fire Department Instructors 85th Annual Conference and Exhibition. Bumperchute Co., the makers of a versatile tailgate command post canopy for first responders who use SUVs in emergency response situations, will be demonstrating the Bumperchute on a Chevy Suburban at the 2013 Fire Department Instructors Conference. Bumperchute is known for their mobile command post kits for emergency vehicles, but also specializes in other first responder products. They are currently featuring a new Medical Rehab Flag and Light kit in their emergency responder online store.